It is always exciting to welcome a new puppy into the home. However, adopting an older dog is a great way for your family to extend a little more caring and compassion toward other animals that are often neglected or ignored. Senior dogs may not be as energetic or playful as their younger counterparts, but they also bring a different kind of joy to the household. An older dog is usually more patient and well-behaved, having had more years of training. They usually understand and communicate with humans better. Also, they have established patterns of behavior and preferences that make caring for them easier. Most importantly, they possess more prominent personal character and have a more varied reaction when interacting with others. Just like humans, older dogs tend to develop stronger personalities. They are less afraid to let their individual character shine. This may sometimes mean though that they are stubborn or less receptive to commands. Instead of butting heads with your dog, give him enough time to adjust to you and your family, and vice versa. Celebrate his individuality by giving him personalized dog collars and creating a comfortable place that he can call his own, with his favorite toys and other personalized items. Older dogs need that extra push to get moving and stay active. Motivate him by giving him rewards for going out, walking, and playing. Make sure that your older pet does not stay sedentary, because this kind of lifestyle brings about physical and emotional problems in the long run. As with humans, being old for a dog does not mean keeping still and staying put. In fact, older dogs need exercise and physical activity to keep their bones and muscles healthy. Sometimes, older dogs have to contend with weaker appetite, leading to problems such as being underweight or dehydrated. Make sure to spruce up mealtimes by offering new foods and flavors — something different from what he has been used to. Be careful though with allergies or any food that is harmful for dogs in general, such as chocolate, onions, etc. Ask your vet for a list of human foods that shouldn’t be introduced to dogs. More trips to the vet. Older dogs are more prone to diseases such as degenerative conditions of the bones, muscles, eyes, teeth, etc. Be prepared to make more frequent check-ups with your vet. Also keep their anti-rabies shots and other necessary vaccinations up to date. Be more vigilant against fleas, ticks, and other pests because older dogs tend to not be able to ward off infections and skin diseases from these parasites. You wouldn’t want your old dog to literally smell like one. It is more ideal to give senior dogs extra-loving care when it comes to grooming. It may take a little bit more time than usual when you give them a bath, clean their ears, brush their teeth, and cut their nails because there is more icky stuff to get rid of. However, your dog will definitely thank you for it! Choosing to take in a senior dog is an important decision that you should be prepared for. Caring for them takes more effort than usual physically, emotionally, and financially, but you will definitely see that the rewards are more than worth it. Never underestimate the power of the bond between man and pet, and the gratitude that dogs can communicate to you in more ways than you can imagine! 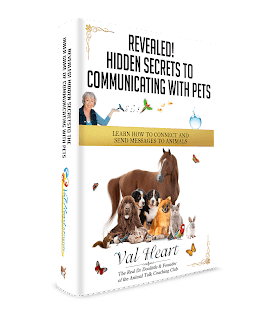 If you’re ready to learn how to communicate with animals, to hear and know their wisdom yourself, then go to www.LearnHowToTalkToAnimals.com Start with your free copy of my ebook Hidden Secrets to Communicating with Pets!